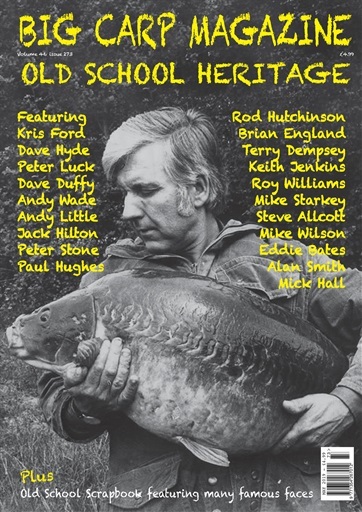 It’s another one of our Old School Specials this month, this time looking back at our Big Carp heritage, the anglers, some still well-known and others perhaps forgotten that were shaping our sport thirty or forty years ago… some even longer! They were carp anglers from an age of secrecy, of originality and invention, carp anglers who were the first of their kind to put pen to paper and divulge their obsession. This month’s cover shot is another classic, depicting none other than the late great Jack Hilton, a carp angler whose tales of old spurred many a young man to try his luck for the ultimate prize, a fish thought virtually uncatchable, the biggest and cleverest in the land, the mighty king carp… I remember so well reading his tales, spellbound, almost transported to the bank where Sir Jack was on his Quest for Carp.